The bio of Sir Edmund Robbins | Launceston Then! Edmund was born on April 4th, 1847 to Richard and Mary Robbins at Launceston. 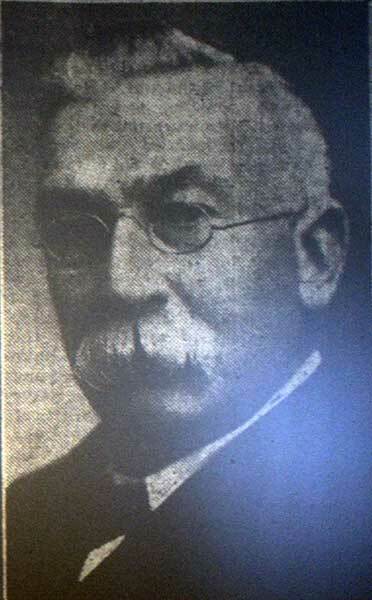 His father was a shoemaker and town councillor running a successful business in Broad street, Launceston. Edmund was educated at Launceston Grammar school under the headmaster Samuel Childs Clarke at St. Thomas road. He continued his education at Priory House Academy and became the first apprentice, at only 11, in 1858, at the office of ‘The Launceston Weekly News’ under John Brimmell. He also acted as an occasional correspondent for ‘The Western Morning News’. He in fact was the lead writer of the Langore murder of Roger Drew in 1862, still only 15. In 1865 Edmund left Launceston to take up a position on the Central Press in London, which had been established by William Saunders. He was then promoted to the editorial staff in 1868, and recalled as privilege that he came under the influence of Edward Spender, who was editor-in-chief of the organization. 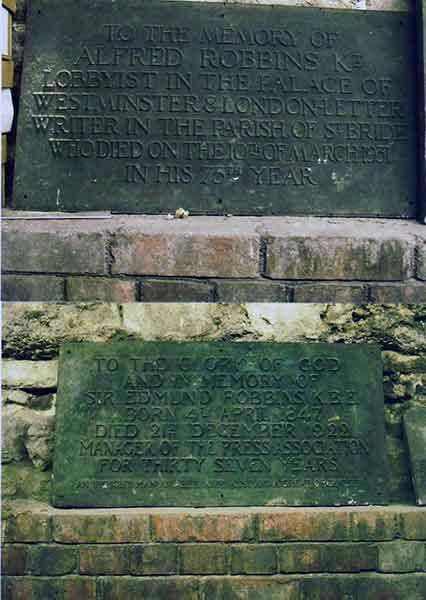 In 1868 an Act was passed empowering the Postmaster-General to purchase the telegraph wires whish had been erected throughout the UK, and this led to the formation of the Press Association for the purpose of supplying the newspapers thoughout the country with news services obtained by their own staff. It was arranged that the Government should take over the telegraphs on February 5th, 1870, and on the previous January 1st, Edmund had joined the Press Association, and commenced his long career with that organization. As the early morning sub-editor he despatched the very first Press telegram. After acting as chief sub-editor for four years, he was elected secretary and assistant-manager in 1874; four years later he became, in addition, chief of the staff, and in 1880, on the resignation of the manager, John Lovell, Edmund was unanimously elected to the management, still only 33 years of age. This position he retained for 37 years, during which period the Association made enormous strides. In addition to his office duties, Edmund became honorary secretary of the Admiralty, War-office, and Press Committee on its formation prior to the first world war. It was for his work as secretary of this committee that he was knighted in 1917. When the Liberator crash occurred in 1892, Edmund joined the committee formed to help those ruined by the disaster, acting as its chairman for many years and overseeing the raising of over £170,000. 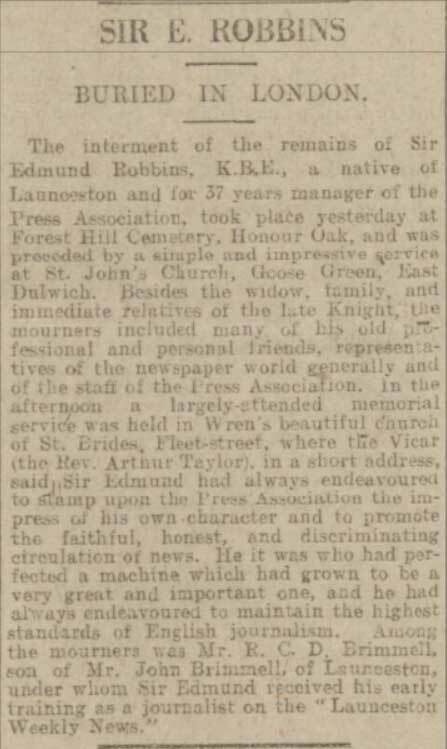 Together with his wife, Jeanette, the only daughter of William Pearson of Launceston, they had twelve children, with Harry C. Robbins becoming joint general manager of the Press Association. Edmund died on December 1922 and was interred at Forest Hill Cemetery after a service at St. John’s Church, East Dulwich. There was also a memorial service held at St. Prides Church, Fleet Street, where the vicar (Re. A. Taylor) made appreciative reference to the deceased. His wife, Lady Jeanette Robbins, survived him by twenty years passing away on March 10th, 1942 at Bognor, Sussex.